Leave feeling stuffed to the turkey and avoid new year ‘trousers-feeling-tight’ guilt with our 10 steps to avoiding that seasonal half stone. If you’ve spent most of the year working hard to get in shape, the last thing you want to do is to start the new year back at square one following some unwanted Christmas weight gain. Despite this, most of us confess to going all out over the festive season, eating and drinking everything in sight, only to wake up in January wondering why on earth we didn’t practise a bit more damage limitation. Commit yourself to a different approach this year by refusing to abandon your health-conscious attitude and getting through the festivities without the extra padding – your body (and mind) will thank you for it when you step on the scales and onto your bike in the new year. Before you protest, we’re not about to suggest you try to lose weight or relinquish festive fun. Instead, your mission is simply to maintain your weight, an attainable goal which will save you from needing to surrender yourself to the new year dieting saga. Think thin: remember you have a choice – decide now that you’re not going to spend January counting calories as well as your overdraft, then stick with it. Let’s be clear – it’s not Christmas day itself that’s responsible for those extra kilos, but the weeks of abandoning healthy habits in the run-up to the festive period. With office parties, work lunches and social events kicking off from the first week of December, you’ve got around four weeks of overeating and potential excess to negotiate. Staying on the right side doesn’t have to mean missing out; you just need to decide on a strategy. The key is to set clear limits – psychologists agree this is a more effective way of staying on track with your goals. Make a deal with yourself in advance about how you’ll deal with the festivities. For example, you might give yourself three ‘free rein’ days (say Christmas Day, Boxing Day and New Year’s Eve) when you can eat and drink whatever you like, but then scale back during the rest of the holiday. When it comes to festive meals, opt for a soup-based starter, enjoy the main, but ditch the dessert unless it’s something you really love, or earn the calories by putting in some additional miles on the bike (see our festive food calculator). For office parties and social events, decide which you really want to drink at and which you can forgo (remembering some won’t be worth the hangover), or decide on the number of alcoholic drinks you’ll have before you set out, and then stick to it. Have a plan: studies show dieters who have specific strategies for dealing with temptation are two to three times more likely to stick to their goals. When it comes to packing on the pounds, boozy nights are as guilty as they come. Not only is alcohol high in calories, it also lowers blood sugar, triggering hunger, and because alcohol lowers inhibitions, you’re more likely to end up falling prey to the buffet table or late-night kebab when you’ve had a few drinks. Effects are also more pronounced if you drink on an empty stomach, and can last until the next morning, which makes an unhealthy breakfast and a day on the sofa all the more likely. To avoid racking up excess calories in the bar, stick to single measures and small glasses of wine, choose low-calorie mixers and steer clear of premium and strong lagers, sugary juices, syrups and alcopops. Calorie-laden festive drinks are also best avoided – a mulled wine contains almost as many calories as a Mars Bar, while a post-dinner Baileys is equivalent to a bag of crisps. If you do fall foul of the bar and end up with a hangover, drink plenty of water or diluted fruit juice – the fructose is thought to help the liver metabolise alcohol. Hangover-relieving breakfasts include eggs (they contain an amino acid which breaks down a hangover-causing toxin in the liver), bananas or honey on toast. Thou shall eat before boozing. A healthy snack eaten before drinking will slow absorption of alcohol and help counteract the fall in blood sugar, which means you’re less likely to end up in the chip shop. Try a chicken and avocado sandwich, peanut butter on toast, or a handful of unsalted nuts and a piece of cheese. Next to alcohol, canapés are the next biggest offender when it comes to ruining good intentions – 10 minutes, a few mini pork pies and sausage rolls later and you’ve packed away close to 1,000 calories without even noticing. As per rule two and three, plan ahead and line your stomach before heading to any canapé parties – the less hungry you are the better you’ll be at steering clear of deep fried snacks. Once you’re at the buffet table, it’s time to practise the art of smart swapping – exchange sausage rolls and pork pies for pastry free meat and fish (think prawn skewers, smoked salmon and ham), switch handfuls of crisps for olives, and ditch the cheese dip for salsa. There’s something about Christmas which attunes our minds to the delights of mince pies, chocolates and cheese twists, but rather than focus on what you can’t have, try placing the emphasis on festive foods which get the green light. Love Christmas breakfast? Make it a traditional start with protein packed eggs and omega 3 rich smoked salmon – a protein rich breakfast switches off hunger and will reduce the likelihood of you snacking. Festive soups such as spiced butternut squash or parsnip and apple are a good choice for lunch in the run-up to Christmas – not only will you get your fill of healthy veg and fibre, research shows a bowl of soup can reduce the number of calories you go on to eat during your main meal. On Christmas Day, go with a decent serving of turkey – rich in protein and immune-boosting selenium and zinc, it’s a satiating food. And there’s no need to avoid the dark meat – it’s tastier, not significantly higher in calories and is a source of fatigue-fighting iron. And don’t go ditching the leftovers – they can be combined with spices, vegetables and yoghurt to make a healthy curry. Let vegetables take centre stage by ditching the boiled sprouts for something which will make the ‘eat more veg’ mantra a breeze – try red cabbage with walnuts, orange spiced carrots and roasted winter squash with chilli. When it comes to sweet stuff, choose mince pies made with filo pastry, pomegranate jelly or a winter fruit salad with cinnamon and a dollop of Greek yoghurt. Commit to keeping the bowls of Quality Street to a minimum and fill your home with healthier festive snacks such as pretzels, roasted chestnuts, satsumas, unsalted nuts and dates. There’s a terrible temptation to fast-track down the ‘all or nothing’ route around Christmas, but indulging in a mince pie or glass of mulled wine shouldn’t trigger you to abandon all good intentions and rip open a selection box for dinner. 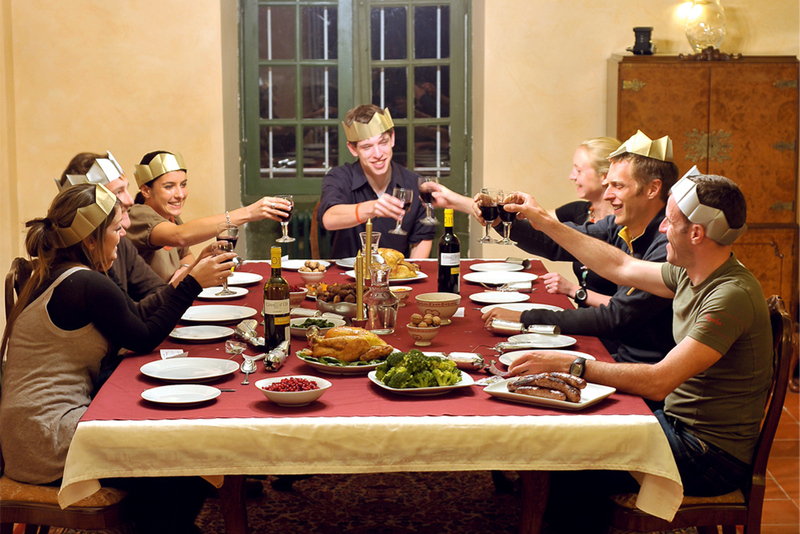 Limit festive ‘overeating’ to the event or meal itself. If someone brings in mince pies, enjoy, but avoid the ‘blown it’ mentality by sticking with one and then continuing with the rest of your healthy eating plan for the day. If you’re going out for dinner, have a good breakfast and healthy lunch, and make time for a session on the bike beforehand. If you usually hit your five-a-day, don’t let yourself stray – there’s no reason to stop. One or two ‘blowout’ meals doesn’t spell disaster, but a whole week or two of sustained overeating will see you struggling to fasten your jeans. Christmas is often synonymous with eating whatever is put in front of us, regardless of whether we really like it or not. Don’t really love that Turkish delight your neighbour always gives you? Stop eating it. You wouldn’t normally eat for the sake of it, so don’t let Christmas be the exception – simply save your calories for something you do enjoy. The hand-to-mouth action which accompanies Christmas television is a killer when it comes to over-consuming calories – it doesn’t take long to polish off a dozen Quality Streets, but it’s a habit which will see you say hello to 550 calories. Scientists believe we consume more when combining eating with other activities because we fail to recognise the signals that tell us we are full. Worse still, research shows distracted eaters tend to suffer from ‘eating amnesia’, forgetting what and how much they’ve eaten. Avoid grazing in front of the television or adopt the one handful rule, and then move away from the tin, bag or plate. Go slow – scientists have found that scoffing quickly puts the brakes on the release of hormones in the gut which help us to feel satisfied. The moral of this story? Eat slowly. It goes without saying, but in the same way that you shouldn’t abandon healthy eating habits, neither should you abandon your bike or other exercise commitments during the holidays. Aim to stick with your usual training routine – as per rule number two, you might decide to give yourself three or four days off, but commit to maintaining as many rides as possible, even if they’re shorter or at a lower intensity than usual. If weather or location issues scupper your best intentions, take to the streets for a run, or try a mini-circuit in your front room. Not only will a post-dinner ride offset turkey coma and disperse family tension, it also gives you the opportunity to earn (or burn) a few extra festive treats, which means you can indulge without the guilt. Are you the lucky recipient of yet another chocolate orange or tin or shortbread? Good intentions to keep that selection box sealed can easily fall by the wayside during the lull between Christmas and New Year’s Eve, especially if it’s in full view each time you pass through the kitchen. Practise a little Christmas altruism and relieve yourself of the extra calories by re-gifting to those less fortunate, or take into work to share with colleagues. Generous? You betcha.